Growing onions from onion sets is probably the easiest way to produce a fantastic crop of quality onions, and in most cases you will be able to achieve better success this way when compared to growing onions from seed. Why? Because most of the hard work has been done for you. To begin with, start with a sunny site that has good drainage, but the key is to grow them in a permanent bed that is maintained year on year in order to build up the soil fertility. There is a downside to this however as you can also encourage the buildup of soil pests and diseases. 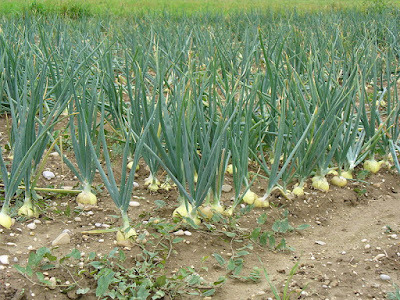 Therefore, some advise that you to rotate your onion bed with the rest of the vegetable garden. 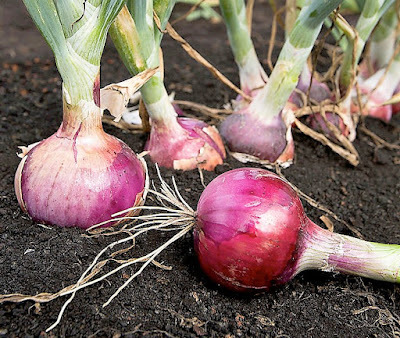 If you are starting fresh, avoid soils that have been planted with onions within the past three years, and because onions are shallow rooted and poor competitors with other plants, try and avoid sites with a history of perennial weeds. If you can, start preparing your onion bed in the autumn by digging in plenty of well-rotted farm manure. This will give the ground a chance to settle over the winter period and allow frosts to break down the soil clods. If your soil is too acidic, below pH 5.5, you will need to add lime to the bed according to manufacturer's recommendations. In general, onions prefer a pH of between 6 and 7.5, and a fine tilth to be planted into. Weather permitting, the frosts should do a good job of this. 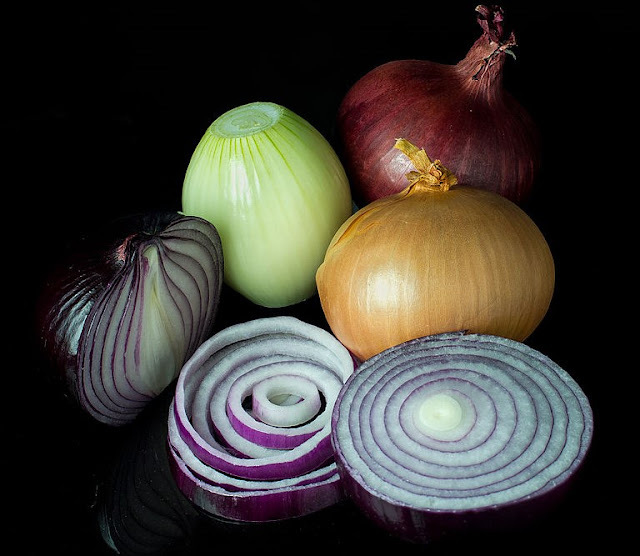 You can plant onion sets as soon as your soil will allow you to which can be anytime from late February, but you can steal a march here by picking a dry day a few weeks before planting and raking the soil to a fine tilth. Onions like a firm bed so tread over the area you have just raked. Try adding a general fertiliser like growmore for extra fertility, and for an even earlier crop you can plant onion sets under protective cloches at the end of January. There is an advantage that can be gained by setting up cloches before planting. If cloches are placed over the ground prior to planting, the ground has some time to warm up, reducing the chances of a check in growth. The soil may require some watering to achieve a uniform moisture before planting onion sets, but try and avoid planting them into a dry bed. Plant onion sets 4 inches apart in rows about 1 foot apart and plant them to a depth where only the very tips of the sets are just showing through the soil. Dig a hole in the soil with a trowel and place them in the hole with their necks uppermost. Do not just push them into the soil as they may grow out of the soil as the season progresses. Micro-nutrients are also important in onion production - in particular boron and zinc - so look at giving your onions a periodic liquid feed of seaweed based fertiliser. However if your onions are clearly growing well then this will probably be unnecessary. You will need to keep a particular eye on newly emerging onion shoots as these will often attract the attention of inquisitive birds (particularly pigeons and blackbirds) who will lift your juvenile plants straight out of the seed beds for nothing more than a little mischievous fun. If you don't have some kind of protection in place you can end up losing almost an entire crop! Onions are not very good at suppressing weed growth, and if regular weeding is neglected they will easily be out-competed for nutrients. This will result in your crop becoming stunted. If you can leave enough space between the rows to get your hoe in for weeding. However, always hand-weed any weeds close to your onions as they are easily damaged by garden tools. To have a year-round supply, you can make a second planting during the late summer which should be ready to harvest from June, although a second planting isn't recommended in heavy, poorly drained soils. Red onion image - Stephen Ausmus, USDA ARS, This image is in the public domain because it contains materials that originally came from the Agricultural Research Service, the research agency of the United States Department of Agriculture.